HouseAppropsGOP/YouTubeSecretary of the Air Force Dr. Heather Wilson, and Air Force Chief of Staff General David L. Goldfein testify before the House Appropriations Subcommittee on Defence, March 14, 2018. President Donald Trump said that the US might create a “Space Force” dedicated to military operations in outer space at a speech given to Marines in California on Tuesday. While the idea has been mocked online, it has been an issue that Congress has brought up in the past. Members of Congress appear to be taking President Donald Trump’s call for a “Space Force” seriously and questioned top Air Force officials about the idea on Wednesday. At the House Appropriations Subcommittee on Defence’s hearing for the Air Force’s budget, Trump’s comments about a space force was the first issue brought up by the chairwoman, Texas Congresswoman Kay Granger. “How do you interpret the president’s remarks?” the congresswoman asked. 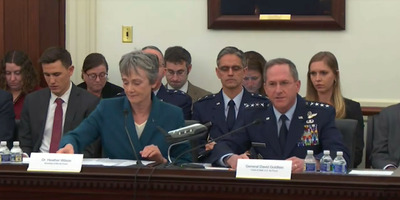 Heather Wilson, the Secretary of the Air Force, responded that the Air Force was capable of handling space missions, and that the budget request emphasised the importance of space operations. “I’m looking forward to the conversation,” she said. The seeming lack of excitement from the military for the creation of a new branch dedicated to space is not new. All space operations for the US military are currently under the command of the Air Force Space Command, and the Air Force has argued that creating a new branch for space would be costly, interrupt current operations, and is unnecessary. A proposal to create the “United States Space Corps,” was part of the 2018 National Defence Authorization Act and would have been administered by the Air Force, similar to the relationship between the Marine Corps and the Navy. The proposal was eventually killed in November 2017, after much of the current and former top brass of the Air Force made their objections known. While the Air Force opposes the creation of a new branch, officials acknowledged on Wednesday that space was a war-fighting domain. “We need to deter, defend, and prevail against anyone who seeks to deny our ability to freely operate in space,” Wilson said in her opening remarks, noting that the budget included an 18% increase in funding for space operations. California Congressman Ken Calvert also brought up that rivals like China and Russia are developing technologies like lasers and other military space capabilities that could challenge US satellites in orbit.